Super Crate Box is an fast-paced arcade action game developed by Vlambeer that makes players try to survive against hordes of enemies swarming them. Prior to the release of Super Crate Box, Vlambeer had not officially released an iOS title. However, evidence sure existed that their titles would work on iOS - not just with the infamous Ninja Fishing that apparently ripped off their Flash game Radical Fishing. It was also Muffin Knight that took particular inspiration from Super Crate Box, adding in RPG-style character leveling and some twists of their own, particularly in updates to the game. So while Super Crate Box's core gameplay is not entirely new to iOS, this iteration of it is, brought to iOS by fellow cloning victim Halfbot, makers of The Blocks Cometh. 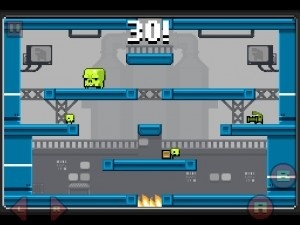 This is a fast-paced arcade action game, where the goal is to collect crates that spawn up in the levels one at a time. Each crate gives the player a new weapon to use, some of which are better than the other. And some, like the disc gun, are just dangerous to the player's health. All the while, enemies are spawning, trying to kill the player and get to the pits at the bottom, where they re-emerge from the top, redder and angrier than they were before. The ultimate goal is to just try and survive, picking up crates one at a time in order to get a high score. Super Crate Box's sessions are short, and while the game is quite challenging, it has that feel of where a high score could be easily attainable if I just didn't screw up that one time...if I focused a little more, I'd have it. Of course, the ability to restart with a single tap goes a long way towards making that "just one more session" desire become reality. In fact, the game makes it too difficult to not continue, or to change level/difficulty: the game has to be restarted, paused, then "Main Menu" selected. Poor controls can really break a game like this. Good news, everyone: the controls are fantastic. They're a stellar example of how to do virtual controls on iOS: they are extremely responsive and easy to use, with just left/right and jump/fire buttons on each side. I certainly didn't feel like I needed physical controls. That doesn't mean that I don't appreciate the iCade support, however: they give the game that arcade feel that makes it feel true to its inspirations. The game supports both portait and landscape orientations on the iPad, which is designed for the iCade, but will work with virtual controls as well. Vlambeer deserve credit for making a fantastic game, and along with Halfbot, they deserve a ton of credit for making this a shining example of how to bring this kind of game to mobile properly. Even after all the weapons were unlocked, I still found myself chasing after the unlockable characters and modes that require superhuman-level performances in order to succeed. This sets a high bar for other iOS releases to try and match this year.